Spend lots of money, ride some rides, and have a great time. Quick – when I say “cotton candy”, “Ferris Wheel”, and “Pig Races”, what do you think? If you’re like a lot of Americans, you think of a County or State Fair. But why should you care about such an event? It’s loud, noisy, wasteful, expensive … and wonderful. While a county fair isn’t the perfect economic stimulus we’re waiting for (this isn’t an argument for or against such a measure, just a survey of a different way money can spread in a local economy), it’s actually a great model of the American economy working in action. State Fairs involve public-private partnerships, induce people to spend a lot of money that lands both back in the immediate community and the larger community, and by the way, they are a lot of fun. So, why do they work? 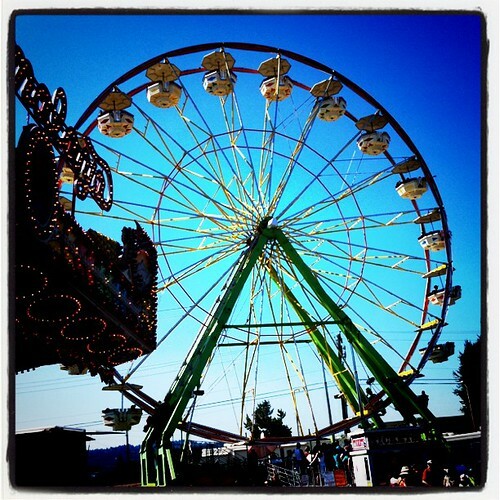 Fairs are time-bound – they occur annually, and usually at a specific time of the year. This creates a lot of pent-up demand and also draws crowds. When you have crowds of people who are looking to spend money (or just to see a spectacle), you get a lot of economic activity in a short period of time. When the fair’s done, it’s done for an entire year, so people tend to spend more money than they would otherwise. State fairs are also excellent examples of reservation pricing – or the presentation of a nearly infinite way that people can choose to spend the right amount of money for them – so you can walk into the door for a low price, stroll around and pay almost nothing more … or spend all the money in your wallet. It’s a rippin’ good time. I’d be remiss if I didn’t point out that the fair is REALLY FUN. Whether you’re riding rides, people watching, or just strolling around to see the unusual exhibits, you are definitely going to see things you don’t see every day. And it’s a great time. Whether you are talking to local 4-H kids, local vendors, or national brands, the fair is a place where your money goes many places all at once. That’s why it’s a neat fusion of hucksterism, local economy, fun, and a genuine good time. Enjoy your local county or state fair – there’s likely one nearby – and remember, if you don’t get to go this year, there’s always next year. 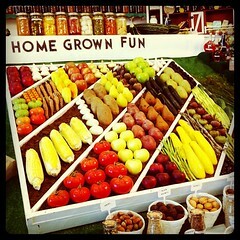 See more pictures of the 2011 Evergreen State Fair in Monroe, WA here.